Students are guided through the latest trends in computer concepts and technology in an exciting and easy-to-follow format. 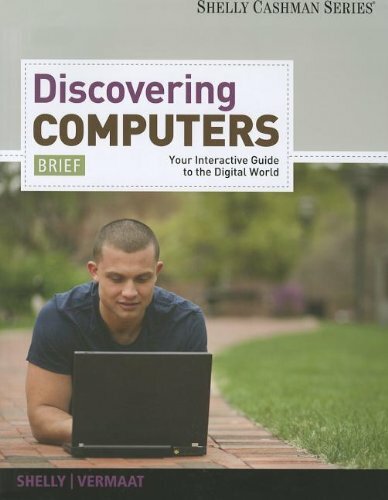 Updated for currency, DISCOVERING COMPUTERS: BRIEF provides the most up-to-date information on the latest technology in today's digital world. Gary B. Shelly wrote and published his first computer education textbook in 1969. More than twenty million copies of Shelly Cashman Series' textbooks have been sold. Gary and a talented group of contributing authors have produced books on computer programming, computer concepts, and application software that are the leading textbooks in the computer technology market today. Gary has hosted the annual Shelly Cashman Institute, a week-long training event focusing on the latest topics in technology, for the past 34 years. Misty E. Vermaat has more than 25 years of experience in the field of computer and information technology. Along with consulting in the field, she was an Associate Professor at Purdue University Calumet, teaching or developing Microsoft Office, computer concepts, database management, systems analysis and design, and programming courses. Since 1990, Misty has led the development of, written, and co-authored numerous textbooks for the Shelly Cashman Series, including many editions of Discovering Computers, Discovering Computers Fundamentals, and Microsoft Word books.